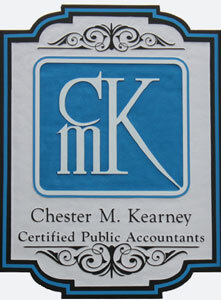 Chester M. Kearney, CPAs is a full-service CPA firm, dedicated to meeting the needs of today's busy professionals. We use state-of-the art technology in order to provide the highest quality of work for you in a timely manner. Still, we're noted for our personal service and our willingness to meet with our clients and discuss their concerns. Chester M. Kearney, CPAs is committed to your success. We make it our business to know your business well enough to improve your tax position, capital position, business structure and benefits packages, acquisition potential, and much more. We earn our fees by adding value to your company and to your asset base. We have learned a great deal since we began in this business, and we are ready to apply this knowledge to enhance your company's growth and success. Together we can conquer all of the intricacies of doing business in today's fast-paced economy. Our mission is to provide high quality accounting, tax, auditing, and peer review services in a timely and efficient manner. We are looking forward to working with you. Our firm was organized in 1943 and has enjoyed substantial growth since then. We maintain a position of dignity and responsibility in the community and we are one of the oldest locally owned firms in the state. Our firm has its main office in Presque Isle and a branch office in Houlton which opened on October 5, 1987. Our primary purpose as a firm is to deliver high quality accounting, tax, auditing, and peer review services. We will continue to be known as the firm where personal attention will never become obsolete. It is the firm's goal to employ people who are extremely qualified and who will go the extra mile for our clients. We strive to promote a culture of enthusiasm, growth, and success throughout our firm. Our clients represent nearly all facets of the economic spectrum, ranging from small sole proprietorships to multi-million dollar corporations. We strive to provide every client, regardless of size, with prompt and personalized service. Our firm is a member of the Employee Benefit Plan Audit Quality Center as well as the Governmental Audit Quality Center. Please take a few moments to visit our website, and learn about the range of services we can provide you. If you have any questions or you would like more information about our firm and its services, please contact us. © 2019 Chester M. Kearney, PA All Rights Reserved.